I’ve done this before. I knew what to expect. I was prepared for it. No, no I wasn’t. This time is so much worse. I remember reading on a few forum posts that the second time around is brutal for a lot of people, but I ignored that and thought I would be different. I was wrong. I want to crucify a chocolate bunny and then eat its remains. Yeah! 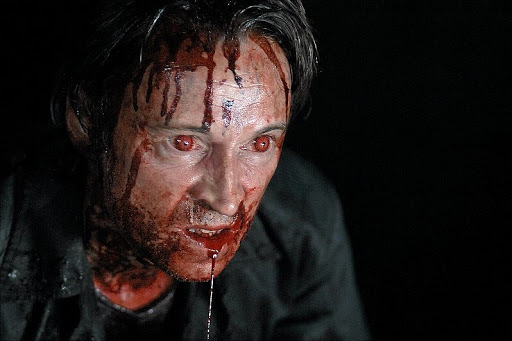 The scene would look something like this…..
….except instead of Robert Carlyle with blood dripping everywhere….it would be me with the zombie eyes and the melted remains of an innocent Mr. Munchie Easter bunny all over my face. Not pretty. Imagine the background noise of two distressed children because mommy went “28 Weeks Later” on their Easter candy and you have a rough approximation of where I am at right now. Add to this the general sense of rage I am feeling over the fact that I have imposed this arbitrary embargo on all things sugar related and my day starts to get interesting. I literally bounce between wanting to eat my weight in Toblerone bars to wanting drown myself in the shower because I am so pissed off at myself for not being able to eat the aforementioned sugar bomb (like my use of a big word there…I used to work for a lawyer). I honestly do not know what way is up today. All I really know is that I am on the verge of “pregnancy level” imbalance and I don’t like it. I am a monster. Over and above that my mouth feels odd, like I have been sucking on a battery or something. It’s gross. Metallic tasting. I am drowning myself in water trying to get rid of it and it just won’t go away. Despite all this emotional turmoil and weird mouth business I did have a “breakthrough” of sorts today. My kids were driving me nuts, I recognize they weren’t doing anything unusually aggravating but, I was being driven up the wall regardless. So, after picking up my oldest from kindergarten I decided to pack them into our car and drive to the den of inequity that is McDonald’s and get them Happy Meals. We were scooting along the road to GMO heaven when suddenly I thought, “what the hell are you doing?” (sorry, but I actually think with curse words) So, I kept on driving right to the Starbucks pick-up window and ordered a brewed coffee (black) and came home. I prepared some leftover chicken, some soup, and a small salad. Oddly enough my salad, soup and chicken did not leave me with that awful junk food feeling in my belly. What’s more, I actually feel sorta … awesome about my choice to drive past McDirty’s. My kids, on the other hand were extremely perturbed that I would go to Starbucks and not get them cake pops. Sorry tator tots, but if I am suffering you should too. Have some carrots and celery instead. This has been my day so far and it is only 3 PM. I have 4 hours until the tator tots go to bed, 3 hours until Mr. Potato comes home, and about 37 seconds left of patience. Tomorrow’s post should be fun….or bitchy….only time will tell.